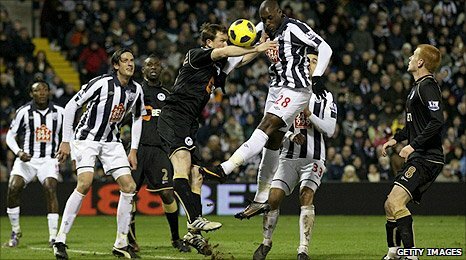 A late header by Marc-Antoine Fortune secured a valuable point for West Brom against fellow strugglers Wigan. The hosts started brilliantly as Peter Odemwingie finished off Jerome Thomas's through-ball after only five minutes. But the Latics turned it around before half-time with two converted free-kicks by Charles N'Zogbia and Ben Watson. As the Baggies piled forward, Fortune hit the post and then nodded in the equaliser from Thomas's cross with Jonas Olsson almost heading a winner. It was a thoroughly deserved point for Roberto di Matteo's side and the home fans will be wondering why the players did not show the same verve and tenacity after drawing level in the rest of this end-to-end encounter. However, with a seventh loss in eight games looking likely with 11 minutes left on the clock, West Brom will be grateful a point ensured they remained three points above the Premier League relegation zone and kept their opponents in the bottom three. With only three points and two places separating the teams near the foot of the table before Tuesday's clash at the Hawthorns, both bosses prepared for battle by declaring how "massive" this game was. Visiting manager Roberto Martinez would have enjoyed the opening four minutes as his team, boasting the recalled striker Hugo Rodallega and midfielder N'Zogbia, ventured menacingly forward. But a swift counter-attack undid all their hard work as the Baggies opened up the scoring in devastating fashion. In their first attack of the game, Thomas burst towards the halfway line and after a perfectly-weighted threaded ball through to Odemwingie, the Nigerian outmuscled Steve Gohouri to coolly slot in his ninth of season. For a team sharing the joint-worst top-flight defensive record with West Ham before the match, though, it would have been little surprise for the home faithful to see their side capitulate before the interval. Their downfall began on 20 minutes and it was all down to the impressive N'Zogbia who created and converted the equaliser with a small dose of help from West Brom's Youssouf Mulumbu. Wigan's star midfielder N'Zogbia, who was subject of a late transfer bid by Newcastle on Monday, darted through the defence to the edge of the box and after being carelessly tripped by Mulumbu, he planted his free-kick into the net thanks to a deflection off the same midfielder's knee. Two minutes before the interval, the Baggies ensured they were the sole owners of the Premier League's record for most goals conceded (45) and it was the result of yet another set piece. Following a chop by defender Gonzalo Jara on Maynor Figueroa, Watson whipped in a free-kick and despite a number of heads flying desperately to clear the danger, the Latics were soon celebrating as the ball nestled inside the right post. Having left the field to a chorus of boos, the West Brom players reappeared for the second half in determined mood and the lively Thomas curled narrowly over after linking up well with captain Chris Brunt. But apart from a couple of dazzling runs by N'Zogbia and a wild shot by Rodallega, it was the Baggies who looked the most likely to score - particularly after the largely disappointing Carlos Vela was substituted with his debut lasting just under an hour. Two wonderful strikes from Fortune and then Brunt that hit the same right hand post helped swing the momentum firmly towards the hosts, and the equaliser soon arrived. Mulumbu passed the ball out wide to Thomas who delivered another dangerous cross and it was left for substitute Fortune to leap acrobatically and head down and low into the empty net. And as the visitors were increasingly forced on to the back foot and the noise levels inside the stadium reaching fever pitch, only a smart save by Ali Al Habsi denied a late winner from Olsson when he pushed his fierce header over the bar. 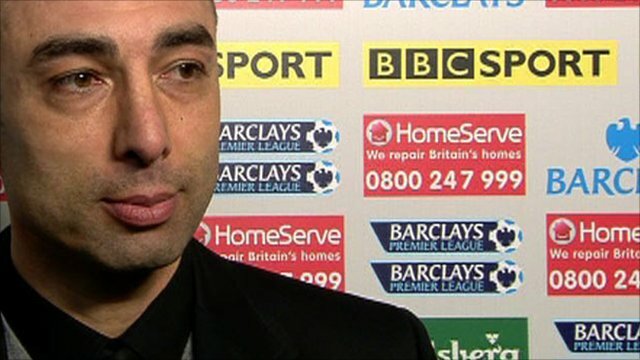 Mixed emotions for both teams but with Wigan now looking forward to games coming up against Liverpool, Manchester United, Manchester City, Tottenham and Chelsea, it may just be Di Matteo who had the bigger smile after this entertaining match. "I'm pleased with the way the players performed. We showed some great spirit to get back into the game. "We hit the post twice and the keeper made some great saves. 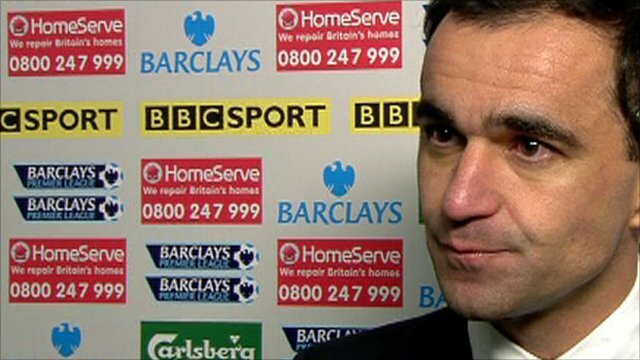 We put a lot of pressure on Wigan and it just doesn't seem to go into the goal at the moment." "We need to know how to wrap up the points. We had a fantastic spell of good football after going 1-0 down. "We went 2-1 up and we had opportunities to score a third goal. It was a relly good open game of football. We should have won. It feels more like a defeat than a point gained." 90:00+5:26 The referee blows for the end of the match. 90:00+4:33 Hugo Rodallega challenges Youssouf Mulumbu unfairly and gives away a free kick. Boaz Myhill takes the free kick. 90:00+2:43 Chris Brunt gives away a free kick for an unfair challenge on Mohamed Diame. Free kick taken by Ali Al Habsi. 90:00+2:43 Booking Chris Brunt is shown a yellow card. 90:00+2:00 Booking Steve Gohouri booked for unsporting behaviour. 90:00+0:49 Chris Brunt takes a shot. Blocked by Steve Gohouri. 90:00+0:40 Outswinging corner taken by Peter Odemwingie, clearance by Hugo Rodallega. 89:51 Unfair challenge on Marc-Antoine Fortune by Gary Caldwell results in a free kick. Centre by Chris Brunt, Marc-Antoine Fortune takes a shot. Save made by Ali Al Habsi. 89:51 Booking Booking for Steven Caldwell for unsporting behaviour. 89:01 The ball is delivered by Youssouf Mulumbu. 88:49 Centre by Somen Tchoyi, Gary Caldwell makes a clearance. 87:04 Jerome Thomas sends in a cross. 87:01 The ball is sent over by Somen Tchoyi. 86:48 Somen Tchoyi sends in a cross, Victor Moses gets a block in. 85:06 Charles N'Zogbia produces a right-footed shot from just outside the penalty area that goes harmlessly over the target. 84:14 Mohamed Diame fouled by Youssouf Mulumbu, the ref awards a free kick. Free kick crossed right-footed by Ben Watson from right channel. 84:14 Booking Youssouf Mulumbu is shown a yellow card. 83:08 Free kick awarded for an unfair challenge on Victor Moses by Steven Reid. The free kick is swung in right-footed by Ben Watson, Youssouf Mulumbu gets a block in. 82:40 Free kick awarded for an unfair challenge on Gary Caldwell by Marc-Antoine Fortune. Free kick taken by Ali Al Habsi. 82:06 The referee blows for offside. Free kick taken by Paul Scharner. 82:06 Booking Hugo Rodallega shown a yellow card. 81:21 Outswinging corner taken by Chris Brunt from the left by-line, clearance made by Steven Caldwell. 80:50 Outswinging corner taken from the left by-line by Chris Brunt, Jonas Olsson takes a shot. Save made by Ali Al Habsi. 80:34 Jerome Thomas takes a shot. 78:20 The assist for the goal came from Jerome Thomas. 78:20 GOAL - Marc-Antoine Fortune:West Brom 2 - 2 Wigan Marc-Antoine Fortune scores a headed goal from inside the six-yard box. West Brom 2-2 Wigan. 77:53 Corner taken by Chris Brunt from the right by-line to the near post, clearance by Mohamed Diame. 75:23 Hugo Rodallega fouled by Youssouf Mulumbu, the ref awards a free kick. Gary Caldwell takes the free kick. 75:23 Substitution Gonzalo Jara goes off and Steven Reid comes on. 75:23 Substitution Franco Di Santo leaves the field to be replaced by Victor Moses. 74:38 The ball is crossed by Franco Di Santo, save made by Boaz Myhill. 73:59 Chris Brunt takes a shot from outside the penalty box and strikes the post. 73:02 The ball is sent over by Chris Brunt, clearance made by Gary Caldwell. 72:28 Marc-Antoine Fortune has an effort at goal from outside the penalty box striking the post. 69:59 Substitution Maynor Figueroa leaves the field to be replaced by Steven Caldwell. 68:05 Charles N'Zogbia produces a cross, Marek Cech manages to make a clearance. 67:15 Free kick awarded for a foul by Franco Di Santo on Youssouf Mulumbu. Gonzalo Jara restarts play with the free kick. 64:23 Foul by Hendry Thomas on Simon Cox, free kick awarded. Paul Scharner takes the direct free kick. 64:23 Substitution Marc-Antoine Fortune joins the action as a substitute, replacing Simon Cox. 64:23 Booking Hendry Thomas is given a yellow card. 62:45 Peter Odemwingie has an effort at goal from just outside the penalty box which goes wide of the left-hand post. 62:22 Foul by Gary Caldwell on Peter Odemwingie, free kick awarded. Direct free kick taken by Chris Brunt. 61:56 Mohamed Diame challenges Youssouf Mulumbu unfairly and gives away a free kick. Paul Scharner takes the direct free kick. 61:13 Substitution Hendry Thomas replaces James McCarthy. 60:22 Corner taken by Simon Cox from the right by-line played to the near post, Paul Scharner produces a right-footed shot from inside the area that clears the crossbar. 59:14 Hugo Rodallega produces a right-footed shot from inside the area that clears the bar. 58:21 Corner taken by Ben Watson. 58:01 Charles N'Zogbia takes a shot. Save by Boaz Myhill. 57:31 Substitution Somen Tchoyi is brought on as a substitute for Carlos Alberto Vela. 55:43 Jerome Thomas takes a shot. Save made by Ali Al Habsi. 53:54 Effort from outside the penalty box by Youssouf Mulumbu goes wide right of the goal. 53:29 Carlos Alberto Vela produces a cross, clearance by James McCarthy. 52:39 The ball is swung over by Carlos Alberto Vela. 52:06 Mohamed Diame gives away a free kick for an unfair challenge on Carlos Alberto Vela. Jonas Olsson takes the direct free kick. 51:51 The ball is crossed by Emmerson Boyce, clearance by Paul Scharner. 50:02 Gonzalo Jara produces a cross, James McCarthy makes a clearance. 49:14 Effort from the edge of the penalty box by Jerome Thomas goes wide of the right-hand upright. 47:51 Jerome Thomas fouled by James McCarthy, the ref awards a free kick. Direct free kick taken by Marek Cech. 46:44 Shot on goal by Hugo Rodallega from inside the box goes harmlessly over the target. 46:30 Franco Di Santo takes a shot. Save made by Boaz Myhill. 45:24 Shot by Marek Cech from outside the box goes high over the crossbar. 45:00+3:15 The first half comes to an end. 45:00+2:47 Inswinging corner taken right-footed by Simon Cox from the right by-line, save by Ali Al Habsi. 45:00+2:30 Short corner taken by Simon Cox. 45:00+2:28 Youssouf Mulumbu takes a shot. Maynor Figueroa gets a block in. 45:00+2:09 Centre by Chris Brunt, Peter Odemwingie takes a shot. Blocked by Steve Gohouri. 45:00+1:11 The ball is sent over by Marek Cech, save by Ali Al Habsi. 44:54 The referee blows for offside against Peter Odemwingie. Direct free kick taken by Ali Al Habsi. 42:36 Free kick awarded for a foul by Gonzalo Jara on Maynor Figueroa. 42:36 GOAL - Ben Watson:West Brom 1 - 2 Wigan Ben Watson scores a goal from just outside the box to the bottom right corner of the goal. West Brom 1-2 Wigan. 41:42 Booking Gonzalo Jara goes into the referee's book for unsporting behaviour. 40:59 Charles N'Zogbia gives away a free kick for an unfair challenge on Jerome Thomas. Free kick taken by Marek Cech. 40:12 Centre by Franco Di Santo, Jonas Olsson makes a clearance. 39:01 Chris Brunt produces a left-footed shot from long range which goes wide right of the goal. 38:12 The ball is sent over by Peter Odemwingie, Maynor Figueroa makes a clearance. 36:13 Free kick awarded for a foul by Peter Odemwingie on Maynor Figueroa. Ben Watson takes the direct free kick. 36:13 Booking Booking for Peter Odemwingie. 33:00 Free kick awarded for a foul by Simon Cox on Ben Watson. Direct free kick taken by Ben Watson. 30:59 Long range shot by Youssouf Mulumbu goes wide right of the goal. 29:30 Corner taken by Ben Watson from the left by-line played to the near post, clearance by Paul Scharner. 29:09 Charles N'Zogbia takes a shot. Save made by Boaz Myhill. 28:24 Carlos Alberto Vela takes a shot. Save by Ali Al Habsi. 25:45 Ben Watson takes a shot. Paul Scharner gets a block in. 24:43 Paul Scharner is penalised for handball and concedes a free kick. Strike on goal comes in from Charles N'Zogbia from the free kick. 23:31 Inswinging corner taken by Ben Watson from the left by-line. 23:23 The ball is sent over by Emmerson Boyce. 21:45 Youssouf Mulumbu gives away a free kick for an unfair challenge on Steve Gohouri. Maynor Figueroa restarts play with the free kick. 21:06 Simon Cox gives away a free kick for an unfair challenge on James McCarthy. Direct free kick taken by Ben Watson. 19:33 Youssouf Mulumbu concedes a free kick for a foul on Charles N'Zogbia. 19:33 GOAL - Charles N'Zogbia:West Brom 1 - 1 Wigan Charles N'Zogbia scores a goal from the edge of the penalty box to the bottom left corner of the goal. West Brom 1-1 Wigan. 17:12 Unfair challenge on Marek Cech by Mohamed Diame results in a free kick. Chris Brunt crosses the ball, Headed effort from inside the penalty area by Jonas Olsson misses to the right of the target. 16:50 Chris Brunt takes a shot. Ali Al Habsi makes a save. Correction - 15:08 Foul by Ben Watson on Carlos Alberto Vela, free kick awarded. Chris Brunt crosses the ball in from the free kick. 15:08 Foul by Ben Watson on Carlos Alberto Vela, free kick awarded. Free kick crossed by Chris Brunt. 15:08 Booking Ben Watson is booked. 13:10 Inswinging corner taken by Ben Watson from the left by-line. 12:46 The ball is sent over by Carlos Alberto Vela, Maynor Figueroa gets a block in. 11:01 The referee blows for offside against Jonas Olsson. Free kick taken by Ali Al Habsi. 10:13 Free kick awarded for an unfair challenge on Carlos Alberto Vela by Mohamed Diame. Free kick crossed left-footed by Chris Brunt from right channel. 9:14 Youssouf Mulumbu challenges Franco Di Santo unfairly and gives away a free kick. Direct free kick taken by Ben Watson. 8:20 Corner taken right-footed by Simon Cox from the right by-line to the near post, clearance made by Charles N'Zogbia. 6:26 Foul by Paul Scharner on Franco Di Santo, free kick awarded. Charles N'Zogbia produces a shot on goal direct from the free kick. Correction - 4:22 GOAL - Peter Odemwingie:West Brom 1 - 0 Wigan Peter Odemwingie scores a goal from the edge of the penalty box to the bottom left corner of the goal. West Brom 1-0 Wigan. 4:22 The assist for the goal came from Jerome Thomas. 4:18 GOAL - Peter Odemwingie:West Brom 1 - 0 Wigan Peter Odemwingie grabs a goal from the edge of the penalty area to the bottom left corner of the goal. West Brom 1-0 Wigan. 3:04 The assistant referee flags for offside against Franco Di Santo. Free kick taken by Jonas Olsson. 1:52 Paul Scharner fouled by Franco Di Santo, the ref awards a free kick. Boaz Myhill restarts play with the free kick. Correction - 0:14 Inswinging corner taken left-footed by Mohamed Diame played to the near post, clearance made by Gonzalo Jara. 0:14 Corner taken by Mohamed Diame from the right by-line played to the near post, Gonzalo Jara manages to make a clearance.